In this chapter we learn how to setup a web server with the apache software. According to NetCraft (http://news.netcraft.com/archives/web_server_survey.html) about seventy percent of all web servers are running on Apache. The name is derived from a patchy web server, because of all the patches people wrote for the NCSA httpd server. Later chapters will expand this web server into a LAMP stack (Linux, Apache, Mysql, Perl/PHP/Python). This screenshot shows that there is no apache server installed, nor does the /var/www directory exist. 0 packages upgraded, 10 newly installed, 0 to remove and 0 not upgraded. Need to get 1,487 kB of archives. After unpacking 5,673 kB will be used. Note that Red Hat derived distributions use httpd as package and process name instead of apache. After running the yum install httpd command, the Centos 6.5 server has apache installed and the /var/www directory exists. This is how you start apache2 on Debian. To verify, run the service apache2 status command again or use ps. Apache2 is running (pid 3680). Or use wget and file to verify that your web server serves an html document. Or verify that apache is running by opening a web browser, and browse to the ip-address of your server. An Apache test page should be shown. You can do the following to quickly avoid the 'could not reliably determine the fqdn' message when restarting apache. Starting the httpd on RHEL/CentOS is done with the service command. To verify that apache is running, use ps or issue the service httpd status command again. To prevent the 'Could not reliably determine the fqdn' message, issue the following command. CentOS does not provide a standard index.html or index.php file. A simple wget gives an error. 2014-05-06 15:10:22 ERROR 403: Forbidden. Instead when visiting the ip-address of your server in a web browser you get a noindex.html page. You can verify this using wget. Any custom index.html file in /var/www/html will immediately serve as an index for this web server. Changing the default website of a freshly installed apache web server is easy. All you need to do is create (or change) an index.html file in the DocumentRoot directory. This means that /var/www/index.html is the default web site. This screenshot shows how to locate the DocumentRoot directory on RHEL/CentOS. RHEL/CentOS have no default web page (only the noindex.html error page mentioned before). But an index.html file created in /var/www/html/ will automatically be used as default page. There are many similarities, but also a couple of differences when configuring apache on Debian or on CentOS. Both Linux families will get their own chapters with examples. All configuration on RHEL/CentOS is done in /etc/httpd. Debian (and ubuntu/mint/...) use /etc/apache2. Debian has a virtualhost configuration file for its default website in /etc/apache2/sites-available/default. In this scenario we create three additional websites for three customers that share a clubhouse and want to jointly hire you. They are a model train club named Choo Choo, a chess club named Chess Club 42 and a hackerspace named hunter2. One way to put three websites on one web server, is to put each website on a different port. This screenshot shows three newly created virtual hosts, one for each customer. Notice the different port numbers 7000, 8000 and 9000. Notice also that we specified a unique DocumentRoot for each website. Are you using Ubuntu or Mint, then these configfiles need to end in .conf. We need to enable these three ports on apache in the ports.conf file. Open this file with vi and add three lines to listen on three extra ports. Verify with grep that the Listen directives are added correctly. Next we need to create three DocumentRoot directories. And we have to put some really simple website in those directories. The last step is to enable the websites with the a2ensite command. This command will create links in sites-enabled. So we run the a2ensite command for all websites. The links are created, so we can tell apache. Reloading web server config: apache2. Testing the model train club named Choo Choo on port 7000. Testing the chess club named Chess Club 42 on port 8000. Testing the hacker club named hunter2 on port 9000. Cleaning up the temporary files. Try testing from another computer using the ip-address of your server. The chess club and the model train club find the port numbers too hard to remember. They would prefere to have their website accessible by name. We continue work on the same server that has three websites on three ports. We need to make sure those websites are accesible using the names choochoo.local, chessclub42.local and hunter2.local. We start by creating three new virtualhosts. Notice that they all listen on port 80 and have an extra ServerName directive. We need some way to resolve names. This can be done with DNS, which is discussed in another chapter. For this demo it is also possible to quickly add the three names to the /etc/hosts file. Next we enable them with a2ensite. After a service apache2 reload the websites should be available by name. You can secure files and directories in your website with a .htaccess file that refers to a .htpasswd file. The htpasswd command can create a .htpasswd file that contains a userid and an (encrypted) password. This screenshot creates a user and password for the hacker named cliff and uses the -c flag to create the .htpasswd file. Hacker rob also wants access, this screenshot shows how to add a second user and password to .htpasswd. Both Cliff and Rob chose the same password (hunter2), but that is not visible in the .htpasswd file because of the different salts. Next we need to create a .htaccess file in the DocumentRoot of the website we want to protect. This screenshot shows an example. Note that we are protecting the website on port 9000 that we created earlier. And because we put the website for the Hackerspace named hunter2 in a subdirectory of the default website, we will need to adjust the AllowOvveride parameter in /etc/apache2/sites-available/default as this screenshot shows (with line numbers on Debian7, your may vary). Now restart the apache2 server and test that it works! Unlike Debian, CentOS has no virtualHost configuration file for its default website. Instead the default configuration will throw a standard error page when no index file can be found in the default location (/var/www/html). We need to enable these three ports on apache in the httpd.conf file. The only way to enable or disable configurations in RHEL/CentOS is by renaming or moving the configuration files. Any file in /etc/httpd/conf.d ending on .conf will be loaded by Apache. To disable a site we can either rename the file or move it to another directory. The files are created, so we can tell apache. Next we need to create three new virtualhosts. After a service httpd reload the websites should be available by name. And because we put the website for the Hackerspace named hunter2 in a subdirectory of the default website, we will need to adjust the AllowOvveride parameter in /etc/httpd/conf/httpd.conf under the <Directory "/var/www/html"> directive as this screenshot shows. When apache restarts, it will verify the syntax of files in the configuration folder /etc/apache2 on debian or /etc/httpd on CentOS and it will tell you the name of the faulty file, the line number and an explanation of the error. sclub42:1: <VirtualHost> was not closed. Below you see the problem... a missing / before on line 4. As you can see, apache will tell you exactly what is wrong. You can also troubleshoot by connecting to the website via a browser and then checking the apache log files in /var/log/apache. Below is a sample virtual host configuration. This virtual hosts overrules the default Apache ErrorDocument directive. Apache supports aliases for directories, like this example shows. Similarly, content can be redirected to another website or web server. You can do much more with .htaccess. One example is to use .htaccess to prevent people from certain domains to access your website. Like in this case, where a number of referer spammers are blocked from the website. Apache keeps a log of all visitors. The webalizer is often used to parse this log into nice html statistics. Below is a very quick guide on setting up Apache2 on Debian 7 with a self-signed certificate. Chances are these packages are already installed. Create a directory to store the certs, and use openssl to create a self signed cert that is valid for 999 days. A little security never hurt anyone. Enable the apache ssl mod. And create the website itself. Enable the website and restart (or reload) apache2. 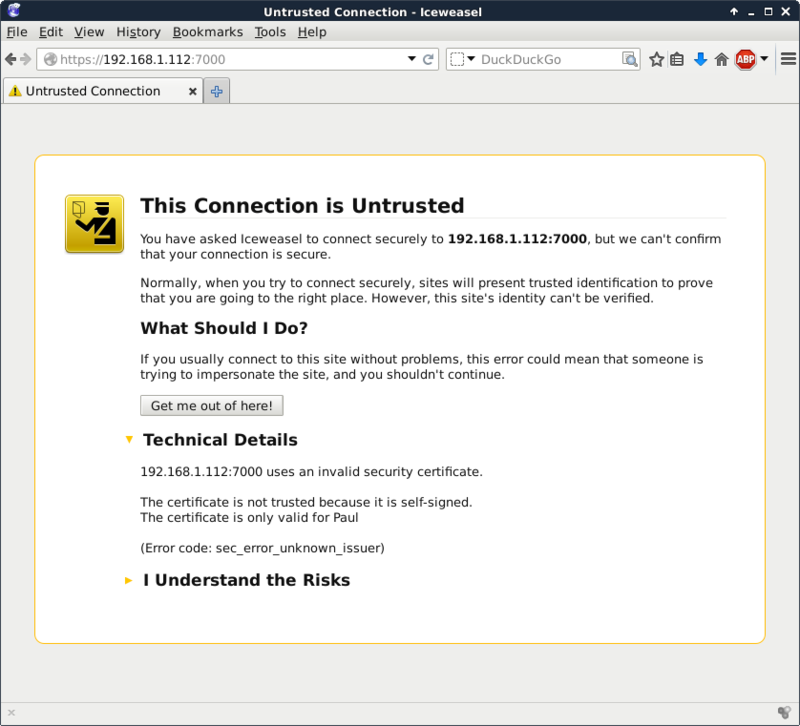 Chances are your browser will warn you about the self signed certificate. We use openssl to create the certificate. We copy the keys to the right location (You may be missing SELinux info here). We add the location of our keys to this file, and also add the NameVirtualHost *:443 directive. Create a simple website and restart apache. And your browser will probably warn you that this certificate is self signed. 1. Verify that Apache is installed and running. 2. Browse to the Apache HTML manual. 3. Create three virtual hosts that listen on ports 8472, 31337 and 1201. Test that it all works. 4. Create three named virtual hosts startrek.local, starwars.local and stargate.local. Test that it all works. 5. Create a virtual hosts that listens on another ip-address. 6. Protect one of your websites with a user/password combo.